So far on the site I've covered how to can tomatoes as spaghetti sauce, salsa, soup and ketchup, but sometimes you just want to have naked tomatoes stuffed in jars. For maximum tomato flavor, I like to pack them in their own juice. Processing takes a little longer than if you pack them in water, but who wants watery tomatoes? 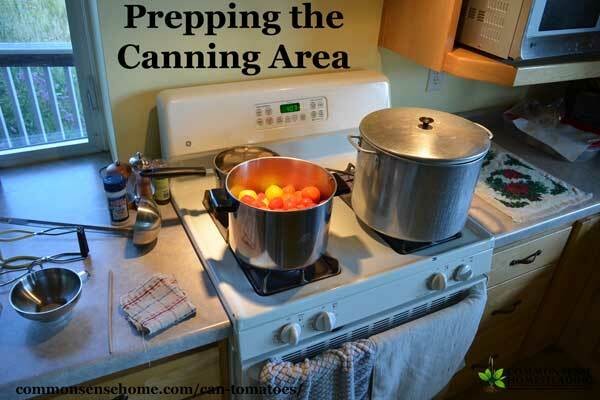 In this post we'll cover what you need to can tomatoes safely, and walk you through the tomato canning process step by step. A canning kit will contain most of these items. Boiling Water Canner or Large Stockpot – If you don't have a canner, you can use a large stockpot that will hold enough water to cover the jars with one to two inches of water during processing. You don't want the jars directly on the pot bottom, so place a folded kitchen towel or metal rack in the bottom of your pot. You can even link together canning rings with twist ties and place them in the bottom of the pot as an improvised rack. Jar Lifter – This allows you to lift jars safely into and out of the boiling water. Jar Funnel – A large funnel that fits standard or wide mouth jars to make filling easy. Lid Wand or Tongs – If you want to preheat your lids (not necessary for most current metal lids, but required for Tattler lids and older metal lids), this can be used to lift the lids out of the warm water. Thin Plastic Spatula or Chopstick – Used to remove air bubbles from the jar prior to processing. Do not use metal! Metal knives or spoon handles may scratch the glass. Mason Jars – All jars should be clean. You should also inspect the jars for any signs of damage, especially nicks or uneven edges on the jar rims that may interfere with sealing. I like to run my jars through the dishwasher to keep them clean and warm for processing. Two Piece Lids and Rings – The ring holds the lid in place, the vacuum formed during processing completes the seal. Big Stockpot – for blanching and heating your tomatoes, 8-12 quarts. 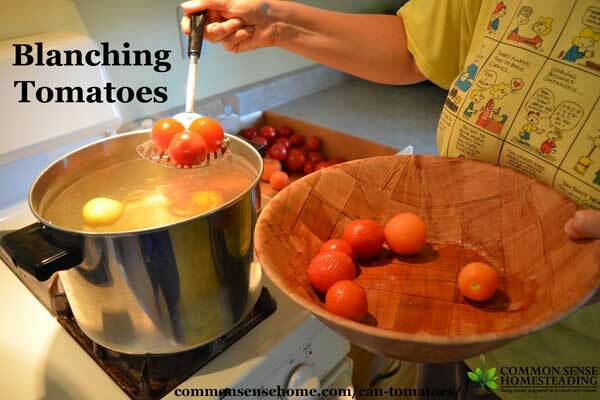 Wire basket or large strainer scoop – to move tomatoes into and out of blanching water. 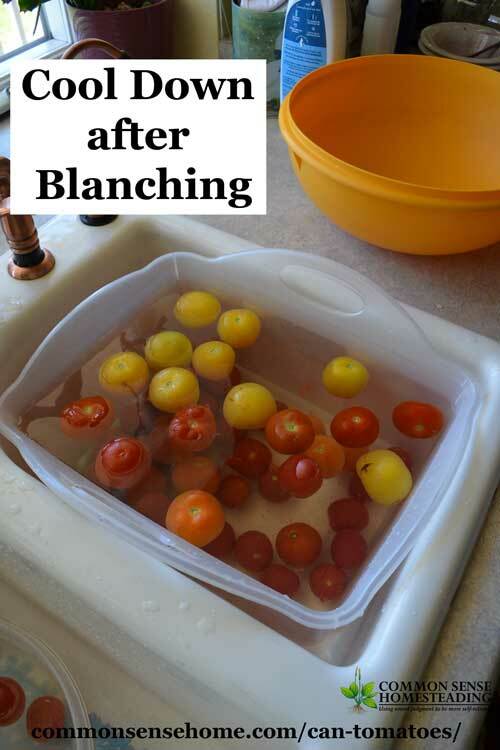 Large basin of cold water – to cool tomatoes after blanching. Big Ladle – to fill your jars. Pairing Knife – to core and quarter tomatoes. A small serrated knife works well. Kitchen towel – After processing, place your finished jars on a kitchen towel. It's best to use an older towel that you don't mind getting stained, in case any tomato juice leaks. What Goes in the Jars? Lemon Juice or Citric Acid Powder – Add one tablespoon of bottled lemon juice to each pint jar, 2 tablespoons to each quart jar. Alternatively, you may use 1/2 teaspoon citric acid powder per quart, 1/4 teaspoon per pint. Citric acid will not affect the flavor of the tomatoes as much as lemon juice. Bottled lemon juice must be used for safety, because it has standardized acidity. For safe water bath canning, pH must be at or below 4.6. 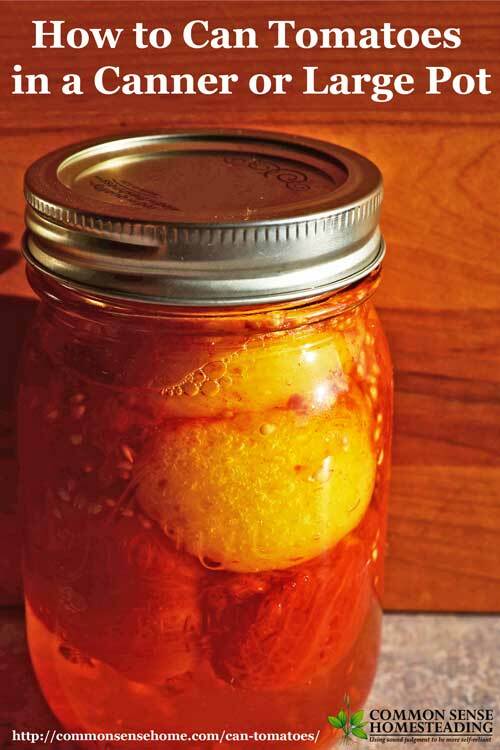 Tomatoes are right on the borderline, so adding acid makes for safe canning. Note: Citric acid is made from corn, so I opt for a GMO free brand of citric acid. Click here to buy GMO free citric acid on Amazon. Wash lids and jars. Rinse well. Keep jars warm in dishwasher, oven at low heat (200F) or simmering water. Fill boiling water canner or stockpot to within 3-4 inches of the top. Heat water to near boiling while you prepare tomatoes. Wash tomatoes. Place tomatoes in boiling water for 60 seconds,until skins start to crack. Remove from boiling water and place into cold water. Slip skin off tomatoes. Cut out core and any damaged areas. Leave tomatoes whole or cut into quarters or pieces. Place tomatoes in a large stockpot, heat through (around 5 minutes). As the tomatoes heat, they should make enough juice to easily cover the fruit in jars. Hold at a simmer. Start filling jars. First, add lemon juice. Add tomatoes, filling jar to 1/2 inch from top. Add salt. Use spatula to remove air bubbles. Adjust liquid so there is 1/2 inch headspace. Wipe rims with clean, damp cloth. Screw on two piece lids; finger tighten. As each jar is filled, set onto elevated rack in canner. When rack is full (or you're out of tomatoes), lower rack into water. 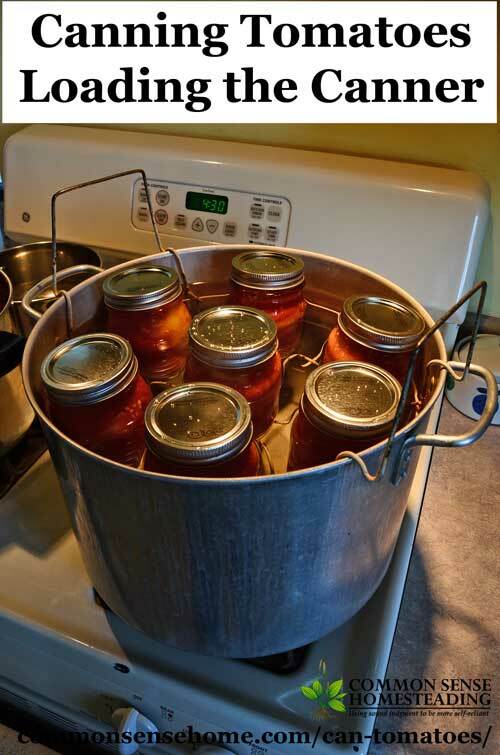 If using a stockpot for canning, lower jars one at a time into the water. Put lid on canner. Bring water to boil, making sure jars are covered by 1-2 inches of water. Begin timing when water reaches a rolling boil. Process pints and quarts for 1 hour and 25 minutes at a low boil. When processing time is complete, turn off stove and remove canner lid. Allow canner to cool for 5 minutes. Remove jars from canner and set them on a dry towel to cool. Do not tighten rings. Let sit for 12- 24 hours, until completely cool. Check lids for seal by pressing gently down in center of lid. The center should be pulled tightly down with no flex. If lid is loose, refrigerate and use within 48 hours. Double check seal by removing ring and gently trying to pry off the lid with your fingers. Once seal is confirmed, wipe off jar and lid with a clean, damp cloth. Label and store in a cool, dark, dry location – too much light will bleach the color out of your tomatoes. After processing, allow to cool for 12-24 hours. There are a ton of videos and posts on the internet that show improper canning techniques. 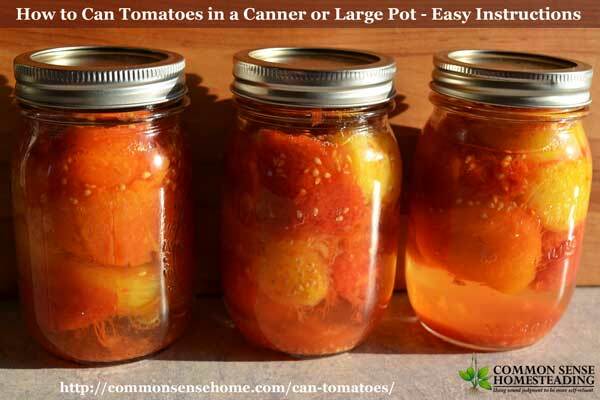 Many people still pack their hot tomatoes in hot jars, screw on a hot lid and call it “canned tomatoes”. There are several ways this can get you into trouble. First, if you're wiping off jar rim after jar rim with the same non-sterilized towel, you may be transferring bacteria to that nice, clean jar. Since you aren't processing, there's nothing to kill off that bacteria. Second, to prevent the growth of botulism, you need a pH equal to or less than 4.6. Many tomato varieties now have a higher pH than 4.6. 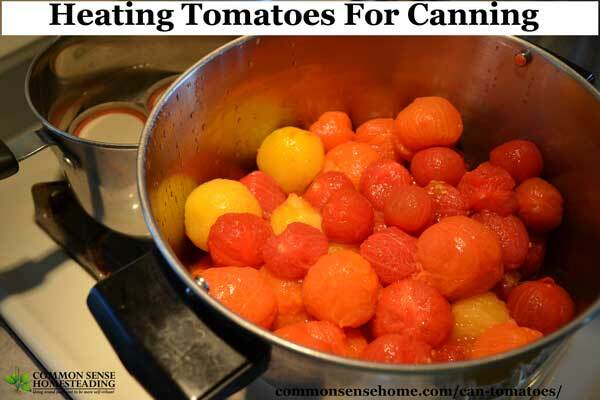 This is why safe canning recipes always add extra acid to tomato products that will be water bath canned. If you seal a jar with food that is above 4.6 pH, you could have a breeding ground for botulism, which can be fatal. 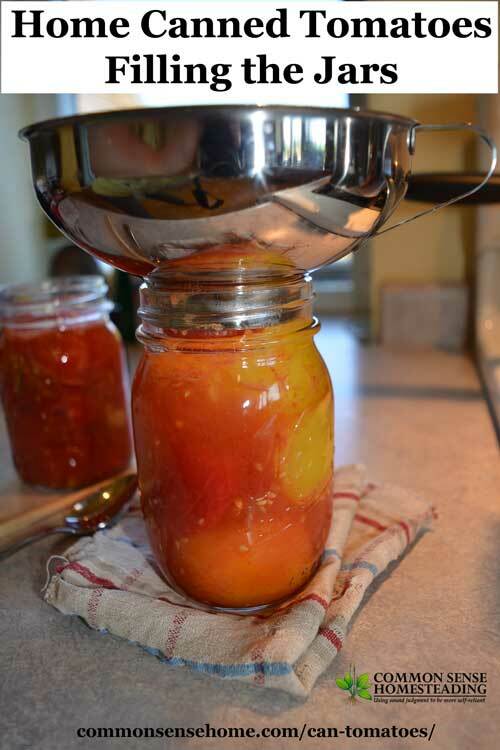 Third, the canning process creates a vacuum in the headspace above the tomatoes. If you hot pack without canning, it's more likely that you will end up with air retained in the headspace, even though the jar has sealed. This retained air can lead to spoilage. I know folks complain about the time involved in canning the safe way, but I spend months growing the tomatoes, and they likely stay on my pantry shelf for several months. To me a little extra time in the kitchen is well worth the peace of mind and knowing that I am feeding my family safe food. Just got done canning tomato puree in a water bath canner and realized that I used 1 tablespoon instead of 2 per quart. Do you think it would be safe to eat those jars since it has some lemon, and if I am only using it for chili/soup that is boiled for a long time? Maybe you could pick up some pH strips and test the acidity in one jar, just to be sure? It’s probably okay, but they usually have the strips pretty cheap at your local hardware store. the pH should be 4.6 or lower. Thanks, Laurie. I have some pH strips here but they don’t go down below 5.5. I’ll have to go look for something else. I’d bet that it’s fine I just get nervous since you can’t see or taste botulism spores.